I’ve been so busy between work,home getting to the game as soon as the gates are open and leaving very late attending Dodger Talk. I have not posted in forever! 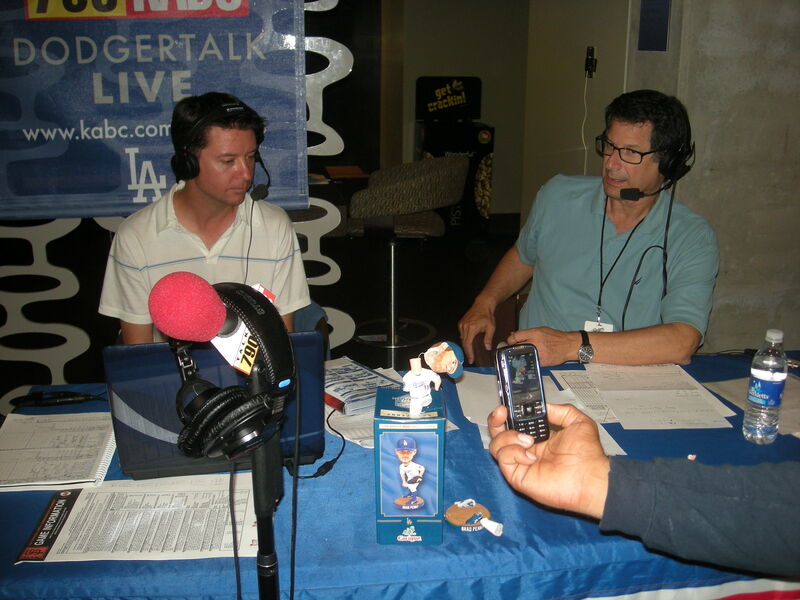 For those of you that do not know the Dodger Talk hosts, here is Josh Sushon and Ken Levine. Oh, forgot about that Penny’s bbh that a fan brought and smashed there. We’ve seen two good games at Dodger Stadium. But wouldn’t you say that both games were left open to criticize the managers? I know the first game many of us Dodger fans were saying “Why oh why did Torre leave Kershaw there too long? Kershaw cruised along for the first 4 innings but the wheels fell off in the 5th where he allowed a single to Ibanez, a walk to Feliz, a homerun to Ruiz (can’t we get this guy out?) and a walk to none other than the pitcher! This is where Torre should have removed the kid. But NOOOO. Kershaw followed with two wild pitches, another walk(3 in the inning) and a double by Howard. That is when Torre decided to remove him and bring in Troncoso, who got Wearth to fly out to LF. A friend was texting me afterwards telling me “let it go Emma, we’ll get them tomorrow.” So I stopped feeling blue and started thinking BLUE! Game 2. It was so freaking hot for the 1:07 game time. Heck it was so hot the night before when I had taken my Dodger poncho. What was I thinking! Anyway, even in the Top Deck where you usually feel a breeze, there was none so you can imagine how it was sitting in the sun and on the field. Remember the picture of the Dodger buckle I posted here. Well, Mike who sits to the left of me in the front row brought me more Dodger memorabillia that he wanted me to see. There is from right to left. A 1988 W.S. ring, 1988 money clip, belt buckle with snake skin, a 1988 W.S. belt buckle, Dodgers pin, 1988 W.S. 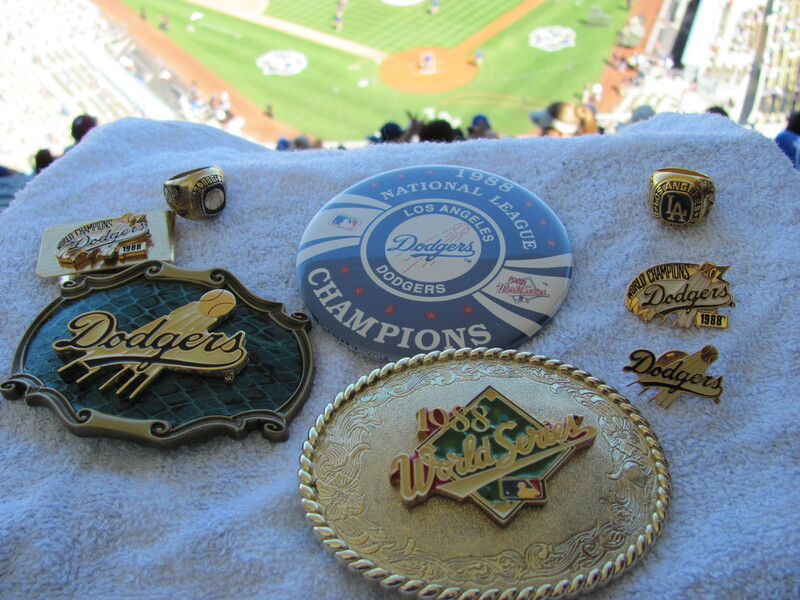 pin, and another ring that lists all the Dodgers World Series the Dodgers have won. Here is a clearer picture of the rings! Thanks Mike for showing me your fabulous collection! Can you imagine Mike paid $6 a ticket for field level in aisle 15? Those might go for $100 now. What a pitchers dual we were seeing on the field! An ex-Phillie and an ex-Dodger were putting a great performance on the field. The only score in 7 innings, was a home-run by Howard in the 4th. In the eighth inning, Charlie Manuel batted for Martinez even though Martinez had given up two hits in 87 pitches. Dodgers could not have more thrilled to get Pedro off the mound. What an eighth inning that was! Charlie Manuel used FIVE pitchers! Thome singles to right off Eyre, Martin to third. Kemp K’s on three pitches. Ugh! The FIFTH pitcher, Durbin, quickly retires Manny on a pop to third. In comes Big Bad John for the save!! I don’t care what Jeff of RedStateBlueState say, Padilla is beautiful!! Now on to Chilly Philly brrrr. 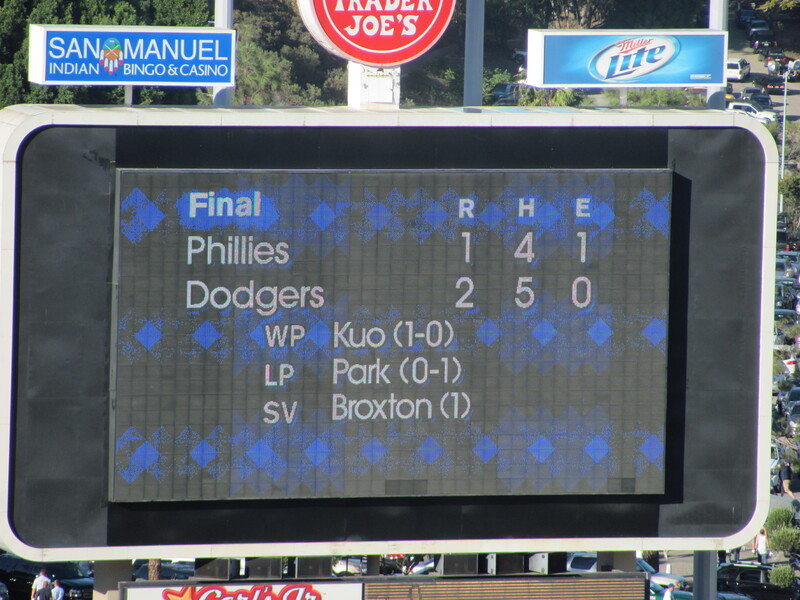 The Dodgers-Phillies game was played in the blazing sun and the Yankees-Angels game was played in the bitter cold. Got to love October Baseball! What extremes in weather between our coasts ha? October baseball at its best. We had rain two days before the games and then it got in up 90’s and 100. I am a warm weather person too and I’ll be thinking warm for my boys in Blue. Sherrill was lights out before but once he walked two in a row in the eighth, I WOULD HAVE YANKED HIM. Can’t wait till game time on Sunday! Congrats on the win, first of all. Both starting pitchers were dealing. Now your guys go to the coooold northeast. Aren’t we glad we’re in SoCal? Dodgers get the cold weather at the start of the season instead of the end so if they make it to October baseball it can be sunny and warm still and not like a winter football game with everybody bundled up in layers. I am listening to the Yankee Angel game. Game tied 2-2. Even with it being so hot here, I’ll take this thank you very much! but in two weeks I’ll be in Boston & New Hampshire. brrrr. We are sure getting the weather contrast of both places. People probably headed to the beach today on this side of the country. Yeah, as you probably remember I’m just about 30 minutes from Philly. This stuff is nasty. I’m not looking forward to the Dodgers having to play in that condition. I should have tried to get tickets I guess but for some reason the thought didn’t cross my mind until it was too late. I guess I was just caught up in the thrill of the Dodgers beating the Cardinals. Yep… he is beautiful… if ya find crogmagnon man beautiful. Haha. Gotta admit… I was more impressed with his performance than I was Pedro’s and that’s sayin’ a lot. Go beat ’em in Philly! I’m rootin’ for ya! Go Dodgers! … Here we go with Game 3 kid… can we get one back????? haha. I think Padilla is better looking than Ibanez. Unfortunately Kuroda-san did not have it and Lee is lights outs. We’ll get them tomorrow. Not this one, but I have high hopes with El Lobo on the mound. congratulations on going 2-0 with the Angels. Boy, that sure was a loooong game. Hi Emma, I have just started reading your blog and really enjoy it. I saw you at the end of game 2 Saturday (I think). You were coming out of the elevator and onto I think the reserve level. I yelled out “Emma!” and you looked around (I think it was you) but it was sooo crowded, you couldn’t see me. It definitely felt like a sellout after the game trying to get downstairs! Hopefully we will really meet at the stadium one day 🙂 Thanks! I did stop in the reserved section both days. I thought I heard some say “Emma” but I looked around and did not see anyone I recognize. After the game on Friday, we headed to the field level where they were hosting Dodger Talk but they dumped us in the reserved section to pickup people on wheel chairs. That is probably the reason why it was so packed there. After a game with the Cardinals, the elevator did not stop in the club level, but took us all the way down to the dugout level. We were wondering why and Cindy told us all to get out as she ha to pickup an emergency. We waited there for another elevator so that we could get back to the field level. Is amazing how many things go on, people getting sick, people getting hit by foul balls. I heard about a woman that said she was going into labor. People dehidrating because of the heat. Hopefully I’ll see you next time. Sorry about tonight’s game. The Dodgers got rocked. But sometimes it’s good to get those blowouts out of a team’s system. And as you said at the beginning of this post: Don’t be blue; think Dodger blue! 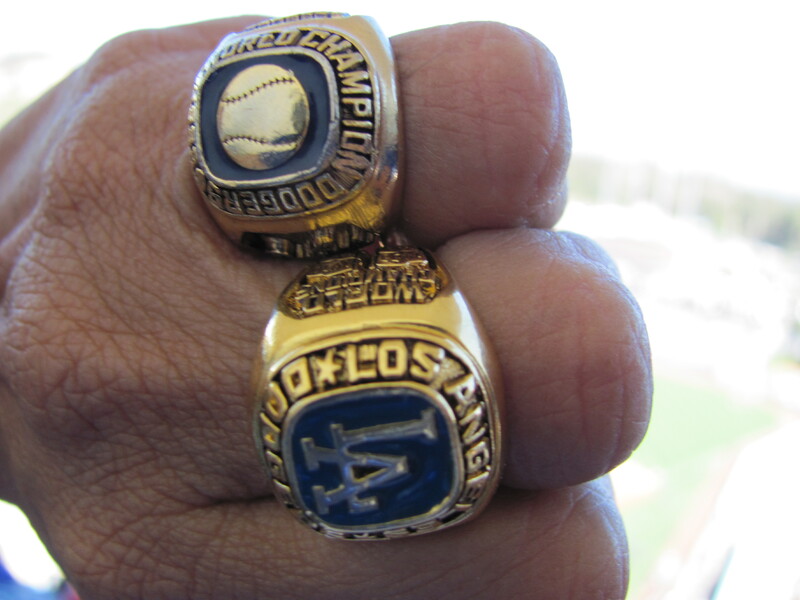 I really dig the photo of those Dodger rings! Now that is some jewelry I would rock, and I’m not a jewelry kind of guy. Have hope. The Wolfman cometh! If he doesn’t get it done … then the Dodgers are probably done. How is Padilla the best pitcher on their staff? And where the heck is Billingsley? If they weren’t going to use Billingsley then why the heck did the Dodgers NOT package him to Toronto for Halladay? Things might’ve been different had they done so. It was one of those games that it was over before the chairs got warmed. Well, probably the chairs in Philly never did get warmed. Yeah, those rings are nice!! The loss was hard to take but It only counts as ONE game. Hope El Lobo brings is A stuff and the guys remember how to hit.